The slide of the GMC 35 linear. SIX CNC-controlled spindle drives with synchronous technology; linear drives in both finish stations; Siemens-CNC 840D powerline with Windows 2000 operating system; MF Programmer as a powerful 3D-programming system; and a continuous clocked spindle drum. These are just some of the features of the new CNC multiple-spindle automatic lathes - GMC 20 linear, GMC 35 linear, and GMC 55 linear - from Gildemeister Italiana, displayed at EMO 2001, and now available locally from DMG Australia . 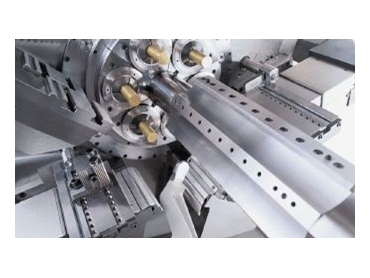 Another unique feature for multiple-spindle machines is the use of dynamic linear drives in the X-axes of the 4th and 5th machining stations. This not only speeds up the process but also maximises the precision since a high positioning accuracy in conjunction with direct position transducer systems are two advantages of linear drive technology. Hardly less spectacular than the linear drives are the advantages of the integrated spindle motors in synchronous technology which provide outputs at 100 per cent ED of between 9.1kW for the GMC 20 linear and 17.7kW for the larger GMC 55 linear in continuous duty, and thus guarantee torques of 15Nm and 84.4Nm respectively. These machines have impressive acceleration and braking behaviour - the maximum speed of 8,000 rpm for the GMC 20 linear is reached after only 1.7 seconds, and the machine comes to a standstill just as quickly. Each spindle is separately controlled. Consequently, work can be carried out in each work station at the optimal speed and cutting speed for the process and material being machined. In addition, the C-axis of every spindle motor also allows a spindle stop or the random positioning of the spindle, which at the end of the day greatly increases the flexibility of the new GMC linear series. The control used is the new Siemens 840D powerline, which excels under the Windows 2000 operating system with a performance which has been improved by more than 100 per cent in the CNC and PLC range. This increase has been achieved through much faster processors from the Intel Pentium class. The completely newly developed MF Programmer 3D also fits in with the innovative image of the new GMC linear series. This offers a whole range of features. For example, the working areas of the multiple-spindle machine are simulated in 3D with a great number of details. After the geometry of the workpiece to be produced has been entered (or loaded), this is also available as a 3D model. The individual process stages can now be programmed step-by-step in the virtual space with menu guidance by simply describing the job sequence. Once the part has been generated, the 3D real-time simulation starts, during which all tool heads can be observed simultaneously. The programmer can then determine whether the individual process stages have been optimally coordinated. If they are not, complete cycles can be transferred almost at random to a different machining station at the click of a mouse. Once the cycle time has been optimised, all that is needed is a collision control, whereby each error in the data record is marked and can be changed with no great problem. An optimised CNC program is then sent to the machine so that the time normally needed to run in the program is reduced to a minimum.